Our beta-testing program is up and running: we have received the PCBs for the beta testing program this week..
And the first assembled K-Ceptors are starting to come out of the oven! We'll keep you up to date with the progress of the building process! The assembling process is gaining a nice momentum now. We have enough boards to make the first suits! We will use the next couple of days to put togheter a test suit and double check everything is working fine (even if the individual test on the boards gave positive results). And probably will be shipping suits to the first betatesters on the list next week!! You are right, we didn't post any updates in a while, sorry about that. 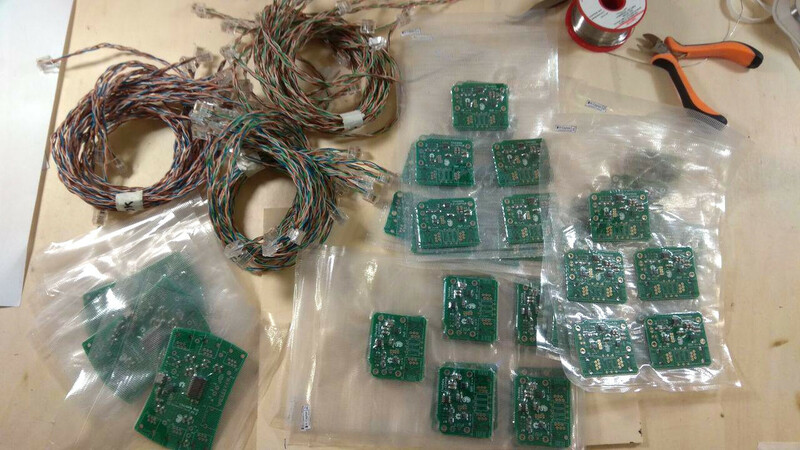 We finished the first batch, so in a few days we’ll start sending the sensors. We can’t wait to know your feedback! Sorry for the lack of communication during the last two weeks. We are now back to the assembling process. We should be able to start sending the kits to the next betatesters on the list next week. We are almost there with the second round of kits!